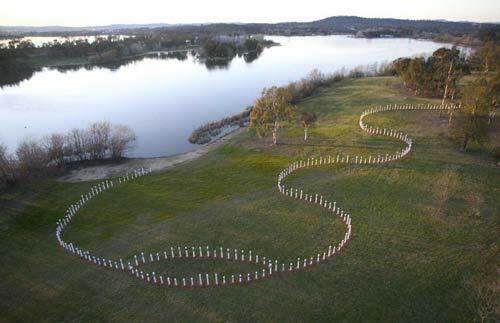 The SIEVX Memorial is Canberra's most memorable and affecting sight. 300 schools and community groups across the country worked to create the haunting and uplifting site at Weston Park. Stretching across 400 metres of lakeshore, it includes some of Australia's most beautiful student artworks, each naming and remembering one of the people who died. Attracting thousands of visitors, it has become a beacon of affirmation that we will not be defined by fear and greed. To get there simply drive along the lakeshore towards Yarralumla, and turn right into Weston Park. The memorial is a kilometre into the park on the waters edge. 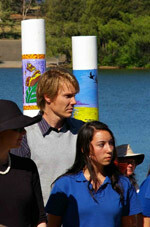 Although the ACT government supported the installation of the memorial, the National Capital Authority were placed in an awkward position as it was strongly opposed by the government of the time. 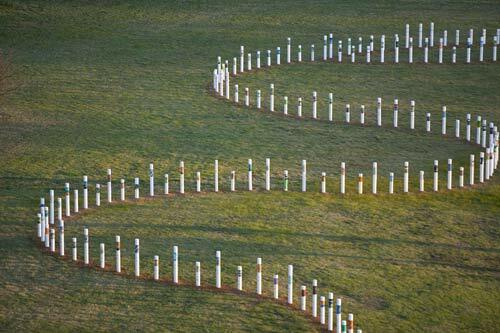 Permission was withheld for a year, and in an act of defiance, 2,000 Canberrans joined the 300 artists, church and school groups and in a special ceremony held the memorial up by hand for five minutes. (See video below). It was one of the most moving and powerful statements of the whole refugee era, and was covered by national and international news networks. A year later the memorial poles were physically installed and have remained there ever since. They have full support of local authorities and are carefully maintained by local church and refugee support groups. They have been visited by family members of the drowned families, and tens of thousands of other visitors including school groups from all over Australia. The Memorial is there, and we think its there to stay ! Recently Steve Biddulph and Linda Dalton met with Minister for Home Affairs Bob Debus who gave personal support to the idea of the Memorial becoming permanent, but stressed that this has to be approved by due process. We are currently submitting to both the NCA for this, and to the ACT Government to extend their current permission until October into a permanent permission. We are very optimistic, the project is well within all guidelines and Labor has previously supported two motions in the Senate to approve the memorial, so is hardly likely to reverse this in government. We are now also beginning to work on the campaign for an enquiry into whether the previous government or its agencies had any role in the sinking or the failure to rescue the 353 parents and children who died. And for the Federal Police to make public their passenger list, so that all the poles can be named and those people's memory be honoured. Please tell your friends to visit the memorial when they go to Canberra. Its a lovely and moving experience that is not easily forgotten, and a sign of promise for a better Australia.